A Side of Toast, a Cup of Coffee and Some Orange Juice Please! Tonight I decided to try these little eggs baked in a muffin tin. I have seen photos of them all over Facebook and I am sure they are on Pinterest too. They looked delicious and seemed easy enough. It was a perfect time to try them, as we wanted something simple for dinner. Sometimes we just love to have breakfast for dinner! Essentially, you place a slice of ham in a regular-sized, greased muffin tin to act as a "crust". Then you drop an egg on top of the ham and then add whatever little extras you happen to have on hand. I happened to have red and green peppers, I shredded some cheese and of course added a little salt and lots of pepper. I was bummed that I used my last onion in last night's tossed salad. Next time! And there will be a next time because these little eggs baked in a muffin tin were very tasty! See how the ham becomes the "crust". I use one slice of black forest ham for each egg. I made six of them and put them in the oven to bake at 350 degrees while I prepared blueberry pancakes on the stove. I really had no idea what temperature to bake them at or for how long (I never did read the recipe--just saw the photo) but they were done in about 20 minutes! The best part is that they slid right out of the tin and they looked presentable. Picture perfect actually! I might just be adding this to my Christmas morning brunch menu! They are so easy to prepare! I will be sure to have an onion on hand for the next batch, some chopped spinach and some diced tomatoes. I imagine that chopped asparagus would be delicious in these as well. The possibilities are really endless....YUM! This turned out to be eggcellent choice for our "breakfast for dinner" tonight. I can't wait to make them again! Here and check it out! Suburbs Mama's Sunday Link Party, Click Here to visit! Check out all of the hostesses below!!! Loves Bakes Good Cakes--Click Here! My Turn For Us--Click Here! Memories by the Mile--Click Here! My Stay At Home Mama Life--Click Here! 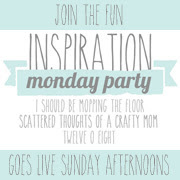 Scattered Thoughts of a Crafty Mom's Inspiration Monday Party! Click Here! Sew Many Way's Sew Darn Crafty Party!